I cannot remember how I came across the website but I have known about Pure Thoughts long before I have been blogging. In the past I have purchased their soaps as they make lovely gifts. 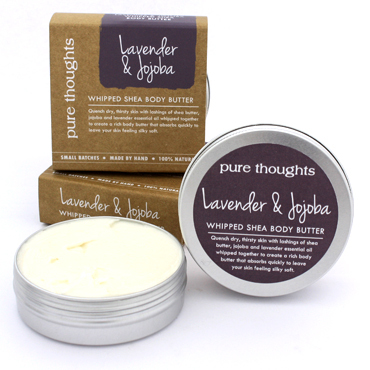 All the products made by Pure Thoughts are free from parabens, SLS, petrochemicals, artificial fragrance, colours and preservatives. This time round I decided to indulge myself in the skin care line and purchased the Lavender & Jojoba Shea Butter body cream/butter. This cream is super thick, rich and very luxurious. It is not something you slap on when you are in a hurry, this is a product to take your time with and pamper every part of your body. It takes a little while for the product to sink in so I use it before bedtime and then when I wake up in the morning there is no residue just super smooth soft skin. You are definitely going to love this product if you have extremely dry skin and I can see myself really benefiting from it during the winter months. A 45g jar costs £6.95 which is a bargain for such a lovely product. It goes a long way and Pure Thoughts recommend using it sparingly. It is available with other fragrances – peppermint and tangerine plus there is an unscented version. Other products on offer include soaps, balms, face masks and scrubs, bath bombs and melts and gift sets. I would also like to compliment the company on fast delivery and attention to detail as my order included a free mini soap. Delivery is limited to UK Mainland, Northern Ireland, Isle of Man and Isle of Wight and the Channel Islands.